Summertime is officially wrapping up. Well, for summer activities, the weather couldn’t be any better because it’s still hot, hot, hot! Boozie doesn’t know how people used to live without air conditioning and drink hot beer. If it wasn’t for AC and cold beer, there would be little reason for me to carry on. 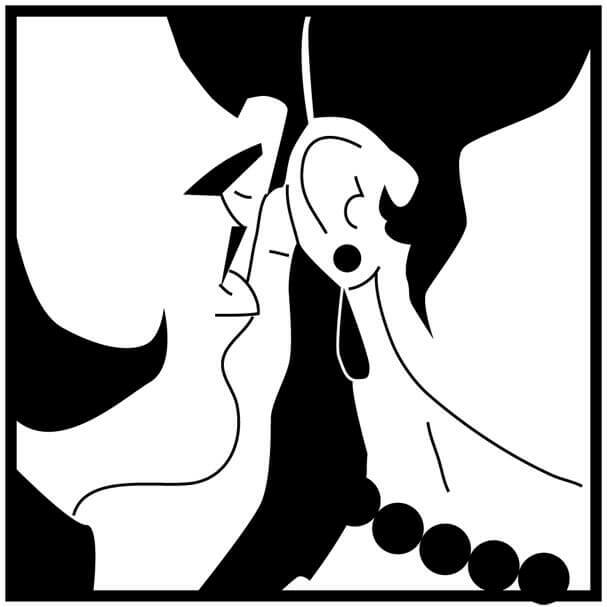 Luckily with modern technology there is both, and I able to muster up the strength to gather up that thirst-quenching gossip you long for! Michael Franti and his band, Spearhead, were in town last Wednesday for a show at the Saenger Theatre. Before the show Michael got in some practice — not at a regular sound check inside the Saenger but instead on Mobile’s new Street Piano. Luckily my spies were at the right place at the right time; Boozie is sorry she missed it. Before the show, Michael was out in the lobby of the Saenger mingling with guests. He told one guest he loves Mobile and talked about how much positive change has happened in seven years since he last passed this way. Not only did Michael enjoy his day in Mobile beforehand, but he also put on a great show, according to my spy. She said everyone was up dancing and singing, and Michael even pulled people up on stage and danced with some of them in the audience. Let’s hope Michael visits again sooner rather than later — Boozie likes the good vibes he brings! Boozie is beginning to think we have traveled back in time. Chockers, cropped tops and jean skirts are back in. But ‘90s fashion isn’t the only thing, Pokemon and Harry Potter are too. Over the last week Boozie has seen more and more Pokemon Go posts and now Harry Potter is taking over. This stuff is bad for business, I need y’all out chasing beers, not Pokemon. Last week around 250 gathered downtown to chase Pokemon. Yep, you read that right, 250 people were downtown not to party but to catch Pokemon. It gets worse — people are spending their Friday and Saturday nights chasing them too! This past Friday night, Dauphin Island had to up their police force to make sure the Pokemon chasers gathered at the water tower were safe. Boozie saw with her own eyes about 30 people just wandering around with their phones. Maybe I would be on board if the app was leading me to free drinks and cute guys. Pic-cutie, I choose you! (Photo | Boozie Spy) An Anonymous patriot suggested Mobile’s ailing infrastructure would get a face-lift under a trump administration. 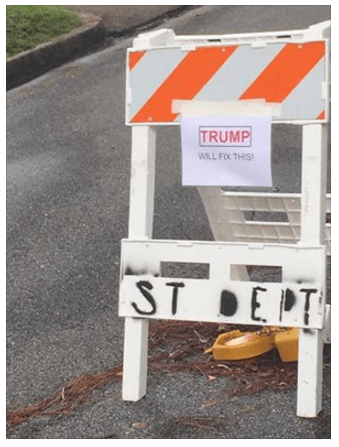 With campaign season really heating up, someone decided to use a local street sign to do a little campaigning of their own for Donald Trump, though much like the GOP nominee it is hard to discern if this “advertisement” was being serious or sarcastic. You decide. Boozie is a non-partisan barfly. I usually don’t report about a business opening unless it is a new watering hole, but I can’t miss the opportunity to tell my loyal readers about the Recovery Room. Somewhat of a watering hole, the Recovery Room, located in the Pinebrook Shopping Center, is an IV bar! Yep, that’s right, Mobile now has a place to help those nasty hangovers go away. Boozie sure does wish she had known about this after the Nappies. Oh, and I can’t forget to mention they have memberships! What could be more perfect? Let’s just say I can’t wait to try it the next time I’m “sick.” Check them out on Facebook. Well, kids, that’s all I’ve got this week. Just remember, whether rain or shine, dramatic or scandalous, or just some plain ol’ Michael Franti lovin’, I will be there. Ciao!